The spot-on that doesn’t need fleas to bite to take effect. 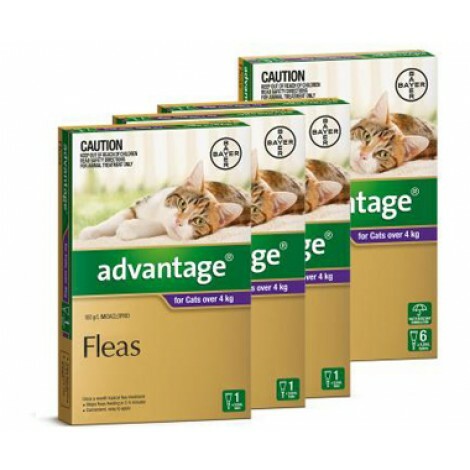 Advantage stops fleas biting fast. The only product to kill fleas on contact, without the need to bite. So pets suffer less of those painful flea bites and less Flea Allergy Dermatitis (FAD). Prevents infestation if your treated pet comes into contact with other pets with fleas. Kills adult fleas and flea larvae within 20 minutes of contact. Advantage is waterproof, Advantage is so safe it can be used on kittens from day one. It can also be used on pregnant and lactating queens. Yes its true, Advantage is so safe you can use it on your pet rabbit or ferret too. This is an Australian registered product labelled in kilograms. A spot on applied once a month to the skin at the back of your dogs neck, Advantage is a registered trademark of Bayer A.G. Leverkusen, Germany.